This little bunny turned out really cute. I read the instructions and was like--okay. My little guy helped me make him and he is adorable. 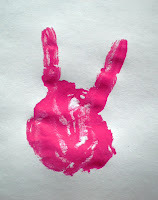 Take the child's hand and paint the palm, pointer finger, and ring finger--just those areas. I used half of a piece of 9 x 12 construction paper. so it' s 6 x 9. Have the children press their hand onto the paper. This is your basic bunny. The final steps are to spice him up. 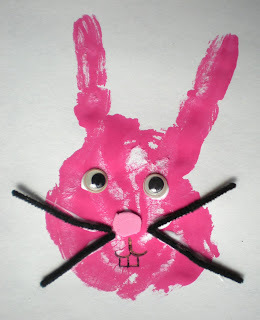 We used wiggle eyes(of course), pipe cleaners for whiskers, and some foam for a nose. At first I didn't put a mouth on him, but the little guy wanted to add the mouth. He looks hungry! I love this! We may do this today.